Need a healthy dip alternative for an event? Don’t hesitate to jump into this bowl of healthy goodness. In this recipe, the saturated fat is reduced and the nutrient value increased. 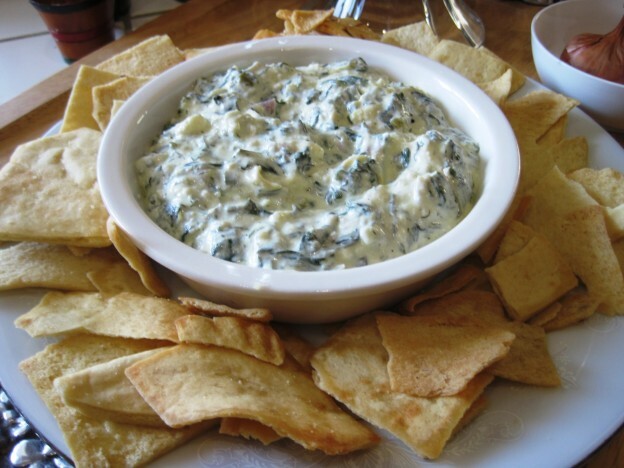 In addition to the health benefits, this is a wonderful tasting dip. Serve warm alongside organic pita chips or pair with chopped vegetables. Heat oil in a large frying pan over high heat. Add artichoke hearts, shallots, onions, and garlic and cook, stirring often, until fragrant, about 1 minute. Add chopped spinach and cook, stirring often, until wilted, about 2 minutes. Pour ingredients into a large bowl and add feta cheese, yogurt, and lemon juice. Stir until well combined and thick chunky. Season to taste with fresh ground pepper and serve warm with pita chips or vegetables.